The sixth international conference in spectral imaging (IASIM-16) was held in Chamonix-Mont-Blanc (France) at the Majestic Congress Centre, July 3rd-6th 2016. This conference brought together speakers, contributors, attendants and exhibitors from areas covering all aspects of spectral imaging (microscopic, macroscopic, remote sensing) and a large part of the electromagnetic spectrum. It included three days of scientific sessions, with oral and poster presentations on any facet of spectral imaging research. Technical sessions included keynote presentations by invited speakers, contributed presentations, panel discussions from members of the imaging community, posters and exhibitors, promoting cross-talks and new ideas. As is tradition, a pre-conference workshop took place one day before the conference, July 3rd, at 2 pm. The workshop was organized as a brainstorm session. The session was opened with a talk, which introduced a problem and addressed several related questions. After that, participants discussed the questions in small groups and came up with possible ideas, solutions, pitfalls, etc. Every group worked on a particular aspect of the problem and presented the outcome of the discussion. Utilizing spatial information when analyzing hyperspectral data. Portable devices for multi and hyperspectral imaging. TOPICAL TALK: Brigitte Leblon, "Overview on Sensing Technologies for Real-Time Monitoring of Wood Properties" – Faculty of Forestry and Environmental Management, University of New Brunswick. PLENARY 1: Yuval Garini, "Rapid Microscopy Measurement of Very Large Spectral Images" – Physics Department & Institute of Nanotechnology, Bar Ilan University, Ramat Gan. PLENARY 2: Frederic Jamme,"Synchrotron light for spectral imaging" – Soleil Synchrotron, GIF-sur-Yvette. PLENARY 3: Giorgio Antonino Licciardi, "NLPCA applications for the spectral compression and denoising of multivariate images" – GIPSA-Lab, Grenoble INP, Grenoble. PLENARY 4: José Manuel Amigo,"Hyperspectral imaging in industrial setups. Adaptation and implementation" – Department of Food Science, University of Copenhagen. PLENARY 5: Lorna Ashton,"Making colourful sense of Raman images of single cells" – Department of Chemistry, Lancaster University. A challenge, developed by Neal Gallagher, was proposed to any registered attendee. Full objectives are described here. The aim was the detection of melamine particles in wheat gluten from NIR Reflectance images. 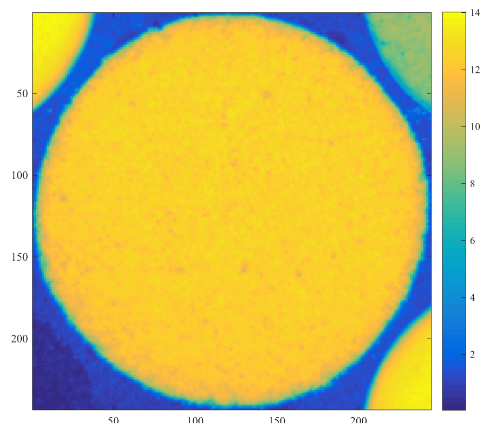 Six images were available: 3 of known composition (for model “calibration”) and 3 unknown test images for “prediction”. Solutions were evaluated on accuracy and creativity by a jury. A special session was be dedicated to the presentation of the three best contributions. The winners were awarded a prize. Aiguilles du Midi: From the centre of Chamonix, a 20 minutes ride in the Aiguille du Midi cable car takes you to the gateway to the high Alps at a height of 3,842 m. The laid-out terraces offer a 360° view of all the French, Swiss and Italian Alps. 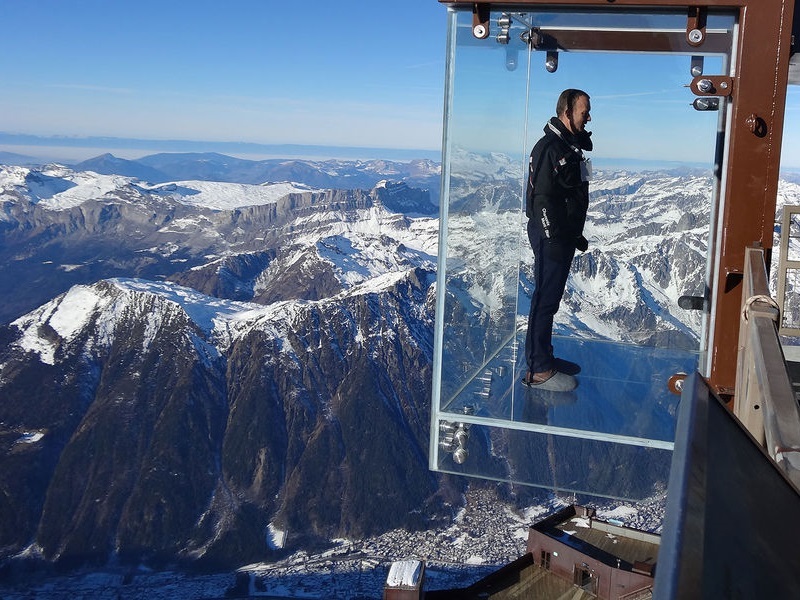 The more fearless will take a step in the void, onto a 2.50 m glass cage out over a 1000 m precipice. 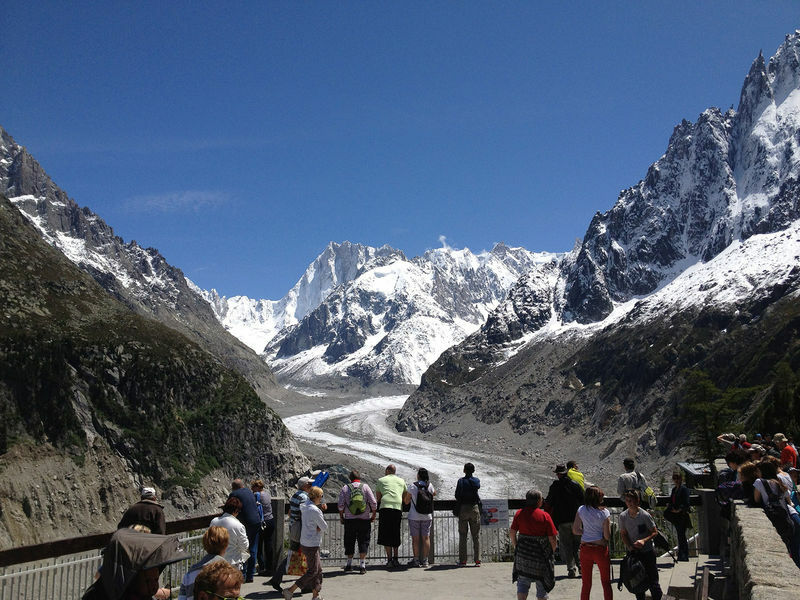 Montenvers (Mer de Glace): Departing from Chamonix, this famous rack and pinion railway brings you to the Montenvers site at 1913 m. An imposing panorama of the Mer de Glace glacier, the Drus and the Grands Jorasses. Copyright © 2018 International Association for Spectral Imaging (IASIM). All Rights Reserved.